Yakhni Pulao recipe by Sajida at PakiRecipes.com. Aniseed (saunf ) 1/2 tbsp. (Wrap all the spices in a piece of muslin & tie with a string to make a spice bag). Long Grain Rice 1 kg. Onions(medium size, thinly sliced) 2. Pour 10 cups of water into a pan & add ginger , garlic , salt , mutton and the muslin bag, bring to a boil. Let it simmer till the mutton gets tender. Sieve the mixture separating the meat pieces. (Do not open the muslin bag, just press it firmly to extract all the spice juice from it). Heat oil in a heavy based pan. Fry onions until they are golden brown. Remove half from the pan & place on absorbent paper, add yogurt, cardamoms & green chillies in the remaining half & stir for a few minutes. Then add mutton pieces & fry for about 5 minutes. Add stock to it & cover. When it begins to boil, add rice & salt . Stir gently to mix all the ingredients. Cover with a tight fitting lid. Lower the heat and allow to cook for 810 minutes, until rice is tender but firm. Place the pan on a heavy griddle(tava) & let it cook for 1015 minutes. Sprinkle fried onions on it. JazakAllahkhairun for your beautiful recipe. I just made it and it has come out stunning . The measurements for the recipe was spot on and the taste is absolutely divine mashaAllah !! 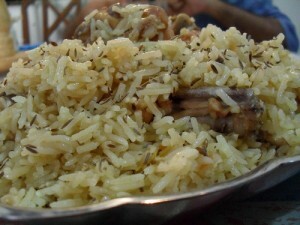 I have been searching for a perfect yakhni pulao and yours is the best. Keep up the great work!! Its yummy and very easy too cook.. before i used to put too many ingredients. like cloves, black pepper but with saunf and corriander seeds its delicious..